USA Building Supplies has expanded their line of products to include warehouse, safety and dock products featuring security partition systems, machine safety guards, work platforms, dock plates, safety mirrors and more. Some say more is less but not at USA Building Supplies. The more products we carry the more we satisfy our customers. 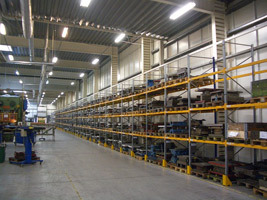 We offer affordable and reliable warehouse products. Create a safe and efficient work environment with our full line of warehouse supplies. Contact the leading commercial building supplier for warehouse supplies including safety and dock products, security partition systems, machine safety guards, work platforms, safety mirrors or our complete line of warehouse supplies 1.855-373-5381.